In the early stages of the company’s development, Alphonse Lonhienne recognised the value of a specialist lamb offering, ensuring unrivalled expertise and service to customers. State-of-the-art production facilities and a dedicated management team ensure the timely delivery of the highest quality specialist lamb and sheep meat products. Today, A. Lonhienne’s philosophy of specialisation facilitates the delivery of a competitive advantage to our customers through innovation, continuous new product development and creative product presentation supported by our consumer brands. A. Lonhienne, as part of Irish Country Meats, is proud to place innovation at the heart of our business. 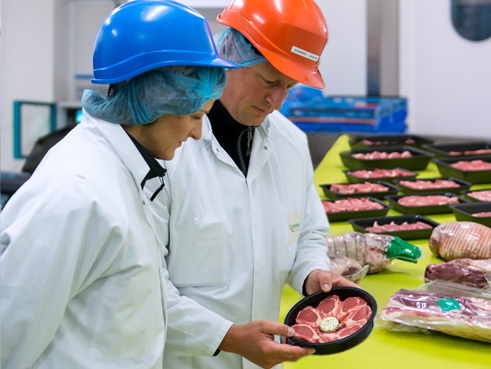 Specialist kitchens, laboratory and New Product Development facilities have been created within the Group to develop world-class innovation in the lamb sector. Key to our strength is the continuous investment in product and process innovation and the expertise of our cross functional New Product Development team, a proposition which is both relevant and unrivalled across Europe. The company’s Discovery and Innovation Centre, which opened in 2012, centralises all elements of the innovation process. This centralisation of all Production, Quality, New Product Development, I.T., and Personnel, facilitates internal team development. The Centre aims to support category management programmes across all market segments using its facilities for training and development. Flexible, purpose built meeting rooms, including a 50-seat conference facility, are available to host customer visits throughout the year.